Hello, hello. Apologies for being a week late; between getting back in to the swing of work life and M leaving town last week, it’s been a busy start to the year. A few weeks in I am finally getting caught up and ready to work on some fun projects this year, both with food and other crafts. I’m also intending to run my first full marathon in June, dependent on how well my training plan meshes with ski season. There are tons of marathons all year so I can always delay a month or so if needed. In any case, with M leaving on Monday and the snow hitting on Saturday, I felt some comfort food was in order. M’s parents generously gifted me a very nice mandolin food slicer for Christmas so scalloped potatoes seemed the obvious choice. 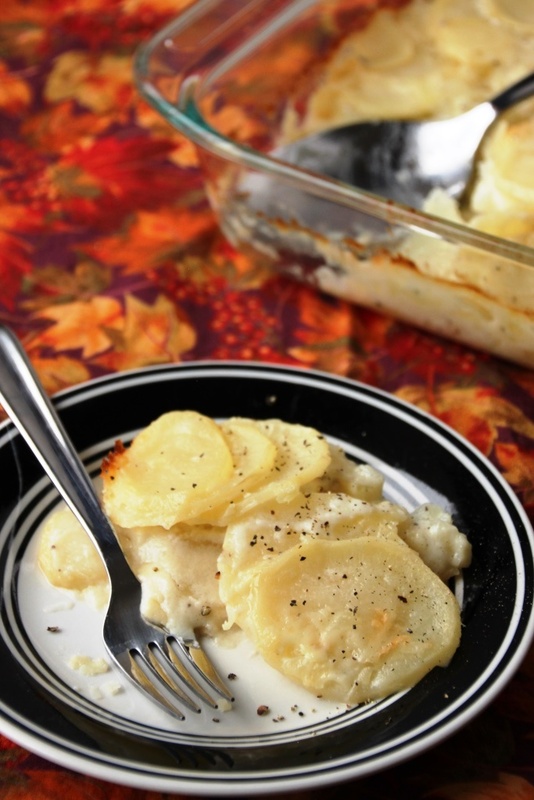 As a kid, scalloped potatoes were always one of my most favorite foods and probably one of the most-requested items each time I came home from college. Warm, and creamy, I could eat them for days and not get bored. They always remind me of family and cozy evenings and often made an appearance for Christmas dinner. Hand slicing potatoes was too much of a deterrent for me to make them on my own, but with a mandolin they are easy-peasy. With just a few simple ingredients they are not going to open a whole new world of flavors, but they are a delicious side dish (or entrée, if you’re me) and coordinate nicely with almost anything. This recipe is straight from the Better Homes & Gardens Cookbook, one of the few I ever manage to use in lieu of the internet. If it isn’t already, this recipe is sure to become a staple in your household; I know it is in mine. 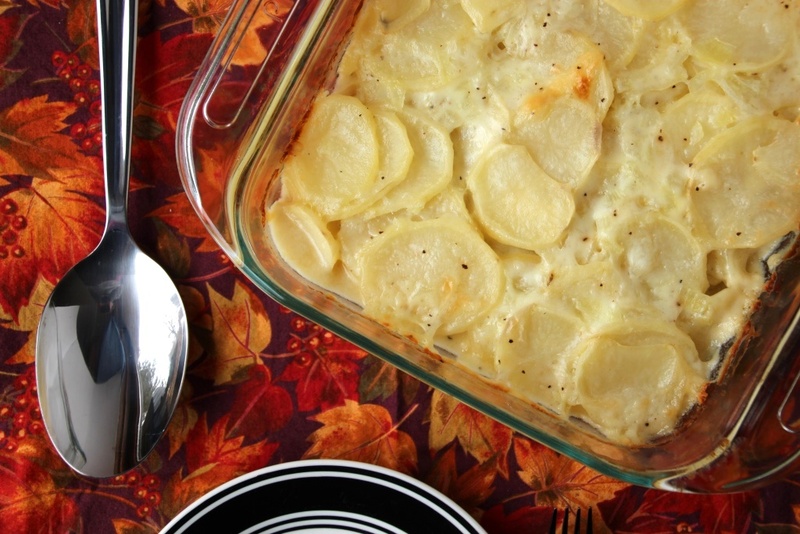 If you have several mouths to feed, this recipe can easily be doubled and baked in a 9×13″ dish instead – this is the way my mom always made it. Preheat oven to 350 degrees Fahrenheit and grease an 8×8″ baking dish. Set aside. 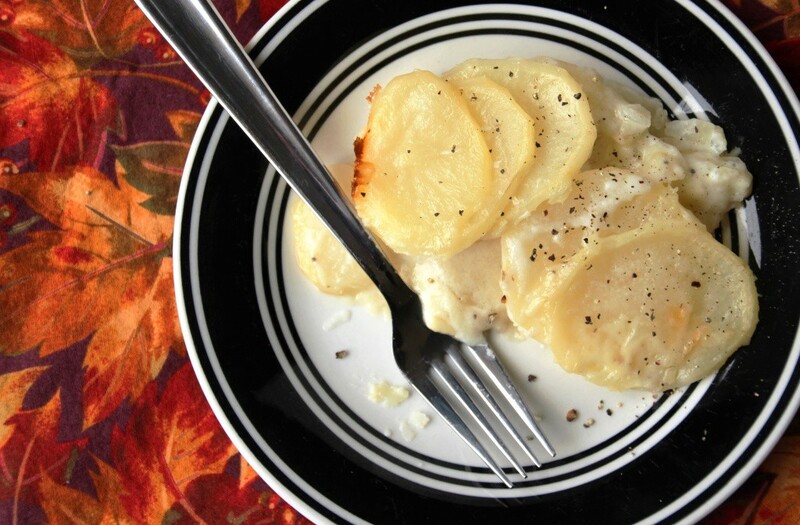 Thinly slice potatoes using a mandolin or a knife and a lot of patience. Place half the potatoes in the prepared dish. In a medium saucepan, heat butter over medium-high until melted. Add onion and cook until tender and mostly translucent. Stir in flour, salt, and pepper, then add milk all at once. Continue cooking and stirring until mixture bubbles and thickens. Remove from heat. Pour half of the sauce over the potatoes, then repeat with remaining potatoes and sauce. Make sure mixture is evenly spread in the baking dish. Cover with foil and bake for 35 minutes. Remove foil and continue to bake until potatoes are tender and a little browned on top, about 30 minutes. Let rest on the counter for 5 minutes, then serve hot, topping with a little extra freshly ground pepper, if desired. If you have leftovers, they keep well in the fridge for several days.